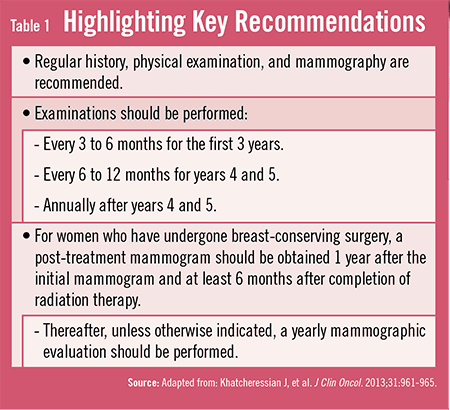 In 2006, the American Society of Clinical Oncology (ASCO) issued practice guidelines on the follow-up and management of patients with breast cancer who have completed primary therapy with curative intent. Since that time, ASCO completed a 6-year, systematic review and analysis of 14 publications in an effort to update these guidelines. ASCO reissued the recommendations from 2006 in the Journal of Clinical Oncology and came to the conclusion that no revisions to the existing recommendation were warranted. Meanwhile, Dr. Smith says other data suggest that patients and physicians do not always obtain tests that are recommended in the guidelines. “Research clearly indicates that patients should undergo a mammogram on the opposite side after definitive surgery for one breast cancer,” he says. “However, study after study has shown that many patients don’t have a mammogram on the other side every year as recommended.” Research also indicates that many patients do not adhere to a healthy lifestyle that includes ample exercise, a healthy diet, and daily aspirin when indicated. 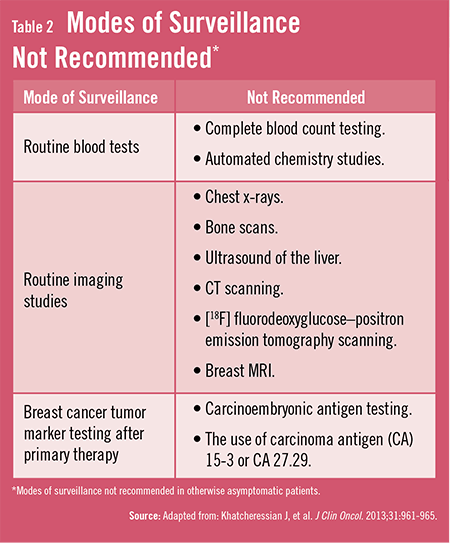 The recommendations in the current ASCO guideline (Table 1) are based on evidence for which interventions are beneficial, but also can lead to other positive outcomes. Adherence to the guideline recommendations can save patients from unnecessary radiation exposure and may be beneficial to the environment due to the production of less radionuclide activity. In addition, better guideline adherence may drastically decrease associated costs of care. The ASCO recommendations state that follow-up care provided by primary care physicians (PCPs) appears to lead to the same health outcomes as follow-up care from specialists, with good patient satisfaction rates seen in those going to PCPs. Dr. Smith says that a simple option for PCPs who are assuming follow-up care with these patients is to coordinate efforts with oncologists. For example, PCPs can ask for a one-page, easy-to-read summary of the patient’s recent history and the oncologist’s expected plan. Khatcheressian J, Hurley P, Bantug E, et al. Breast cancer follow-up and management after primary treatment: American Society of Clinical Oncology clinical practice guideline update. J Clin Oncol. 2013;31:961-965. Khatcheressian J, Wolff A, Smith T, et al. American Society of Clinical Oncology 2006 update of the breast cancer follow-up and management guidelines in the adjuvant setting. J Clin Oncol. 2006;24:5091-5097. Morrow M, Waters J, Morris E. MRI for breast cancer screening, diagnosis, and treatment. Lancet. 2011;378:1804-1811. Houssami N, Ciatto S. Mammographic surveillance in women with a personal history of breast cancer: how accurate? How effective? Breast. 2012;19:439-445. (PET) and positron emission tomography/computed tomography (PET/CT) for the diagnosis of breast cancer recurrence. Health Technol Assess. 2010;14:1-103. Lu W, Jansen L, Post W, et al. Impact on survival of early detection of isolated breast recurrences after the primary treatment for breast cancer: a meta-analysis. Breast Cancer Res Treat. 2009;114:403-412. PreviousWhat’s the Point of Medical Licensing? Thomas J. Smith, MD, has indicated to Physician’s Weekly that he has received grants/research aid from the National Cancer Institute, the Avon Foundation, and The YC Ho/Helen & Michael Chiang Foundation. New CDC report: How many Americans have diabetes or prediabetes?